Do I need a custom-made mouth guard? Children are back at school and have started signing up for their favourite sport. Adults are also signing up for the new season of sport. A sports mouth guard is a removable rubber or soft plastic shield worn over your upper teeth during sport to prevent dental injuries. There are basically two types of mouth guards. The boil and bite mouth guards that you buy from the pharmacy and the custom-made professionally fitted by your dentist mouth guard. The Australian Dental Association recommends that only a professionally custom-fitted mouth guard should be worn. The mouth guards you buy from sport stores and pharmacies are often bulky, ill-fitting and fall out. While they may be cheaper to purchase initially, they offer little or no protection of your teeth. Mouth guards should be worn by adults and children who participate in contact sport such as football, boxing, rugby, hockey, softball and basketball. Even accidental elbows in low impact sport can result in trauma to the mouth and jaw. Any person participating in recreational activities such as skateboarding, mountain biking etc would benefit from wearing a mouth guard. 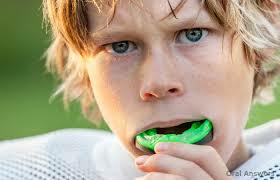 According to the Australian Dental Association only 36% of children aged 5-17 wear a mouth guard when playing sport. Why wear a mouth guard? Every year thousands of children are treated for dental injuries, which could have been prevented or the severity minimized by wearing a protective mouth guard. Protect your or your child’s teeth with a custom fitted mouth guard. The dentist will make an impression of your teeth and then mould the mouth guard over the model. Mouth guards provide maximum protection by cushioning teeth, jaws and soft tissue against impact. Mouth guards absorb and distribute the force of an impact. They can also reduce the chance of concussion. How to look after your mouth guard? Health care funds provide a rebate on the cost of mouth guards as a preventative measure to protect your teeth for life. Dental trauma can mean time off work or school and reconstructive dental care can be expensive. Come and talk to us about protecting your teeth with a mouth guard.